Our family lived in Hickstars Lane from 1949 – 1963. The road was situated on the southern fringe of the new South Green Council Estate. In the early days our houses faced open fields, but that rural environment was soon to change. Only 4 or 5 families in the road owned cars in the 1950’s and our first one was a 1934 Morris 10/4, reg. AMV 829. 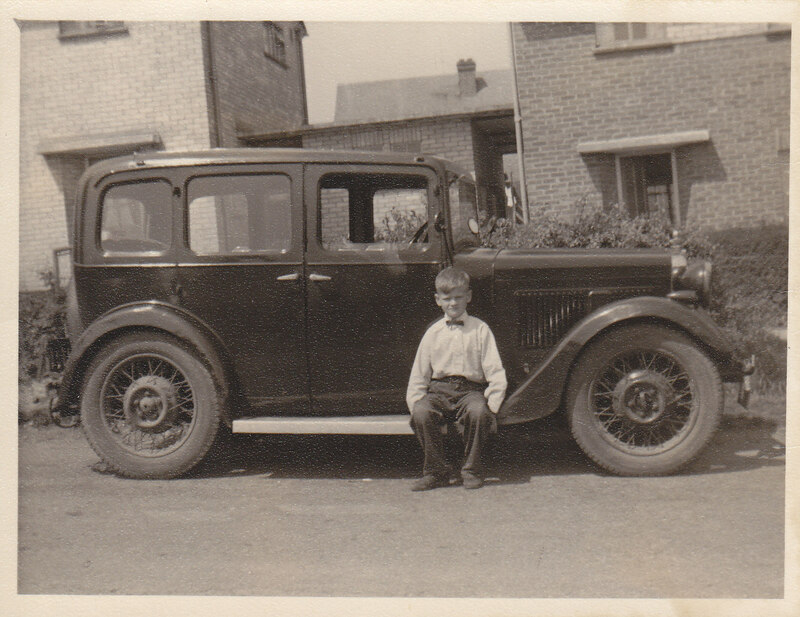 The photo shows me in my Sunday best sitting on the running board while it was parked outside our house. I can still remember the names of most of the families who lived in Hickstars Lane. The parents will no longer be alive but the (now grown up) children will be either my age or younger. I wonder where they all are now. Mr Young lived at no.6 and he owned a left hand drive American Buick. He started up his own coal merchant business using a couple of repainted ex army lorries which were parked at the rear of Walden’s garage in Southend Road. Mr Martin lived at the top end of the road and he was a teacher at Billericay School. The path outside our houses had quite a steep slope and I used to go careering down it on my home made go-cart. My older brother, Robin, had a Lambretta scooter which he parked in our front garden. All the rear gardens had chain link fences, so there wasn’t much privacy. But in those days, we didn’t sit out in our gardens and use them for leisure purposes like we do today. In 1961, I must confess to blowing up an abandoned car left on some waste land opposite our house. The loud explosion caused neighbours to come running out thinking a bomb had gone off, cap guns and empty fuel tanks don’t mix. The stupid things some 13 year olds do! My dad rushed me to hospital for a check up but I didn’t suffer any after effects. I think the car was a write off! I’m not sure of the date but I witnessed the aftermath of 2 buses colliding on the bend at the bottom of Hickstars Lane. Some passengers were shaken up and given cups of tea by a lady who lived in one of the cottages along the unmade road opposite. The end detached property had a lifeboat parked outside it for many years. Perhaps the skipper lost his way! The bend in the road was straightened out after we had moved from Hickstars Lane to Chantry Way. We couldn’t afford many luxuries in those days. It was a momentous occasion when we acquired our first (second hand) fridge and had a Cyril Lord fitted carpet laid in the living room. Our houses, although fairly new, didn’t have central heating or double glazing. During the winter, I had to warm my clothes on a paraffin heater before putting them on in the morning. I then went out early to start a paper round from Weedon’s between 1961 and 1964. My remuneration was 13/- (65p) per week and I delivered papers up Highfield Road (when it was just a dirt track and a footpath), along Southend Road to the King’s Head P.H. and then the full length of Mill Road. The hard winter of 1963 tested my resolve, but the papers got delivered to everyone every day. 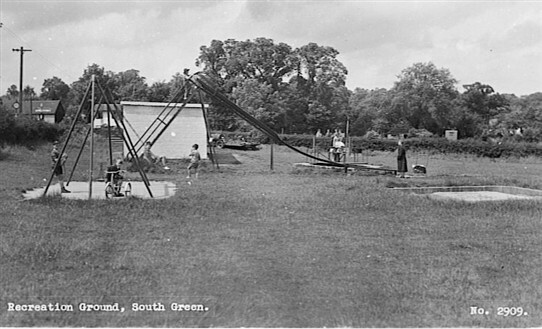 Many happy hours were spent playing in South Green recreation ground. I don’t know if the shelter was originally an air raid shelter or not, but it incorporated toilets at the rear – the condition of which left a lot to be desired. Our dog, Rover, followed me into the gents once and cocked his leg against the urinal – much to the amusement of the other occupant! One day, some rascal scrawled candle wax on the surface of the slide. The next unsuspecting youngster got more than he bargained for and went flying off the end landing on his bottom. I attended South Green Chapel in Outwood Common Road in the 1950’s. Mr Hewitt was the Sunday School teacher and by coincidence he was my R.E. ‘O’ level teacher at Billericay School in 1963/64. On Wednesday evenings, mum attended whist drives at South Green Memorial Hall. Sometimes I went too and helped make tea for the card players. It was probably a welcome change from staying in and watching black & white T.V. on a grainy 12” screen. My father, George, was a toolmaker and rode a BSA ‘winged wheel’ (a motorised bicycle) to work at Rotary Hoes in West Horndon. My mum, Evelyn nee Cullis, worked part time in various shops in the High Street and also Gatleys general store and butchers, now converted to a residential property, adjacent to Gt. Burstead Church. Another shop, Fennell’s, later called Grange Stores, was situated by the junction at the bottom of Church Street. Before it was converted into a private dwelling, it was the scene of an armed robbery. The gunmen were soon apprehended and after a trial, they were sentenced to 7 years imprisonment by Judge Brian Watling Q.C. at Chelmsford Crown Court. I sat on the jury that convicted them. The engineering factory, A. A. Cullis & Co, which was situated on the bend halfway between the King’s Head P.H. and Barleylands, was owned by my great uncle. Several members of my family worked there during the war years and they lived in the end semi-detached property opposite. My grandfather edited the Works and Club Magazine which was issued to all the employees. I have the first edition dated November 1937. During the 1950’s, a friend and I used to play in the chicken farm attached to No. 1 Elm Cottages, Coxes Farm Road. The property was occupied by an elderly and slightly eccentric gentleman called Mr Shepherd. He lived, ate and slept in the front room of the house and there was an outside toilet at the rear. Mr Shepherd could be seen on his bike with a wicker basket hanging from his handlebars, delivering fresh eggs to local customers. One sad event which had a long lasting effect on me was the death of a school friend in the mid 50’s. His name was Stephen Norris, aged 8 or 9 and he lived in Langham Crescent, No. 6 I think. Although my mother must have shielded me from all the publicity, I believe he died in a road accident while riding his bike down Bell Hill. I saw his father carrying the small white coffin and I remember where he is buried, in an unmarked grave, in Gt. Burstead churchyard. There are many family connections with Gt. Burstead church and several relatives are interred in the old cemetery. My parents were married in the church in 1938, followed by me in 1972. Reverend Holley conducted our wedding service and he was also present (in a wheelchair) when my wife was ordained at Chelmsford Cathedral in 1999. I’ve just spotted your article on the website Janet. Lucky you living in Melbourne. When I was single, I had plans to emigrate to Brisbane, but a certain young lady had other ideas! I remember your family very well. I was very envious of Barrie’s train set which we used to lay out on your hall floor. I remember too the day Rosina was married (1960 I think) and watching her walk along the path in her lovely wedding dress. Your dear mum used to have radio on in the front room and sing along to the music. She had a wonderful singing voice. Our house at no. 12 was recently sold and while it was empty, the estate agent allowed me to have a look around it. Goodness, what a transformation! In fact Janet, if you ever returned, Hickstars Lane would hardly be recognisable now. Keep well and nice to hear from you. I am Janet (Young) from No.6 Hickstars Lane. It was lovely to see these messages, they brought back lots of happy memories of living there. I remember nearly all the neighbours especially the hunts, the Hunters, the Campbells, the Lockharts and the Leonards. I played with Angela Hunt, I used to go shopping with Roberta Lambert, I played with Noel and Ray Hunter and also Paul and Terry Campbell. I was friends with Margaret Leonard, Mary Hamber and Jackie Fell. Happy days. My sister Rosina now lives in Wickford, my brother Albert in Cambridge and younger brother Barrie in Westcliff. I live in Melbourne Australia and have been here for over 40 yrs now, but I often think about my time in Hickstars Lane. It would be great to hear from anyone that remembers me 🙃 love from downunder. Although my only visits to Hickstars Lane was to go to school in the 60s, I remember some of the names particularly from the comments. I went to school with John Lambert, and Susan Smartand attended Jucos at the Outwood Common Chapel with Lawrence Butcher. Hi Terry, I have just stumbled across this page and remember many of the names you have mentioned. You wonder whether one of your friends that you used to play with is still around. My eldest brother Noel Hunter is indeed still around and living locally. Living in The Oaks to be precise. I myself am living in Langdon Hills. Best Wishes,Ray Hunter. I remember your dad he worked at railway in Billericay, also remember Mr & Mrs Smith 26 Blanch and Harold Smith I believe their names were. I lived at 24 from around 1972 ish . It has been very interesting reading the comments on this site. I lived at No. 28 with my three sisters. There was a number of us as children that played every evening on the green at the top of Hickstars. Some of the children came from Kennel Lane. My dad used to mend many of the neighbour’s wireless sets and then later televisions. My favourite place where I really loved and belonged, moved to a Trinity Rd new house, new hopes. Felt at the start I belonged, about 1959. Later moved to Briar Close & brought up our family of Lawrence, Sharon, Matthew and Jonathan. I’m sure my children would remember well the many names of those who lived and went to South Green School. The chapel in Outward Common was our spiritual home. My husband and I worked with the Hewitt’s in Covies as it was affectionately called, my husband, now with the Lord, became a Pastor there. We later moved to Whites Farm just a mile away, where housed the lame and halt and blind. So many beautiful memories. Terry you must know a good friend of mine Geoff Owers who lived in Mill Rd. We both remember the Fays and I remember Heather and Leon Smith. Have you any idea where they are now? Geoff and myself went to Billericay School but we left in about 1955. I certainly remember Mary Fay as she came to my house and borrowed the Eagle comic once a week and when she left on her bike I would run after her until she picked up speed. Years later I went to see her before she died, rather sad that. I was born in 1964 in Hickstars Lane at number 38. My Dad (Paul Campbell) still lives at number 10 Hickstars, my Nan (Margaret) was the house’s first tenant – I can remember my Nan taking me to visit Mrs Smith and Mrs Hunter next door – so lovely to read this page and get a feel for the Hickstars lane of old. Correction… Mr & Mrs Bloomfield lived at No. 22 with their 3 children Maureen, David & Roger. The family that lived at No. 26 before the Smiths was Mr & Mrs Martin with their 3 children Anne, Roy & Anthony. Mr Martin was science teacher at Billericay Secondary Modern School but in 1955 moved to Crays Hill Primary as headmaster. Hi John, We lived at no. 12. I remember the Lambert family at no. 2. Your mum sometimes sat in the sunshine outside the front door and your dad had an impressive vegetable garden at the back. I used to play with Noel Hunter at no.8. I wonder where he is now. I also remember the Smith family at no. 26. I think Trevor Smith worked in the fishmongers near the Chequers P.H. Mr & Mrs Bloomfield lived at no. 26 before the Smith family. I lived at 26 Hickstars Lane in 1960 for five years with my sister Christine and later my youngest sister Diane joined us. We were fostered by Mr and Mrs Smith, they had a grown up family Leon, Heather and Trevor was a teenager when we moved in with them. I remember playing in a spinney at the end of the road, I went to school across the road, down the bank that was like Everest to me! We went to chapel and sunday school, and brownies. I took my sister to see Hickstars Lane, the house and school last weekend, it’s not such an Everest that bank now or that steep road! Mr and Mrs Smith fostered no end of children before us, and after us, and I am grateful to them and the family and the local community for the happiest memories of my childhood. Hi, Have you got a sister called Nina? I used to live in 4 Hickstars Lane, only moved out in 2000 but still in Billericay. I remember the Lockhart name but sorry can’t place where you lived at the moment. I am the youngest of 6 children in the family. We lived at no.12 and yes, the house next door on the left is no.14. At that time it was occupied by Mrs Leonard who had a daughter Margaret and a son Brian. If that’s number 14 in the background then that’s my old house, moved out 6 months ago. Keith, A good guess but I’m not that old! Mrs Edith Lockhart was my step grandmother. After my paternal grandfather died in 1963, she continued living in the detached bungalow called ‘Farmview’ until she died in 1982. I did deliver papers there in the early 60s as well as No. 25 Mill Road which was occupied by my auntie ‘Lil’, Lilian Capon. Terry, would your mum have been the Mrs Lockhart who lived opposite me in the detached bungalow in Mill Road.